When people would approach Abraham Joshua Heschel and ask, how to start “doing more Jewish”, he would say, light Shabbat candles. This was just one the moving anecdotes shared by his daughter, Susana Heschel, a professor of Jewish Studies in her own rights, when she spoke at Berkeley’s Beth Israel this past week. Just that. Don’t worry about the rest. 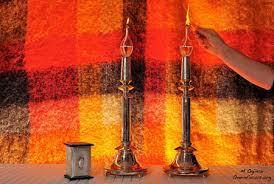 Light Shabbat candles. Doing anything unusual for Shabbat which differentiate it from the rest of the days, anything at all, from a meal to consciously putting the phone away to stopping by at shul to just lighting candles can have a profound impact on one’s whole week. Shabbat, as I read somewhere (and lost the source :-(), is like a gas station on our crazy drive along the highway: only 6 more miles and we can get some refreshments! Even before receiving the Ten Commandments, Shabbat is part of our people. In this week’s parashat Beshalach, when we have to make do with desert bread, we’re told that bread will rain (Exodus 16:4) from the heavens, and the people can collect that “stuff” as food, but not on Shabbat. On Shabbat no manna will show up on the ground. Instead, a double portion will come down on Friday. At first the people didn’t know what it is; then they found is sweet and tasteful. Some say that the manna tasted like anything you wish! If you felt like stew with potatoes and veggies, it would be it; and if you felt like honey-poppy cake, it would be that. And by the way, speaking of poppy cakes, the notorious Purim hamantashen which in Hebrew became Oznei Haman, Haman’s ears, started out in Yiddish as pockets full of moan, or manna. Of course, at first the people didn’t believe Moses that this “thing” will show up daily and tried to hoard it, but it quickly spoiled. So they got used to the routine: every morning a “layer of dew was gone up, behold upon the face of the wilderness a fine, scale-like thing, fine as the hoar-frost on the ground”. They would collect it, and eat. Then came Shabbat. Once again, they worried. Moses said, take a double portion, but should we go out tomorrow too? So they went out on Shabbat as well, but didn’t find. A beautiful Chasidic commentary asks: what is the meaning of “they didn’t find?” the word find (matz’u) is used only in the case when one looks for something that was there and is lost. But the manna on Shabbat was not supposed to be there? The midrash fills in the scene: some of the leaders who later rebelled against Moses were already causing trouble. They took some of the manna collected on the 6th day and scattered it in the field to show that there is on truth in Moses’ words. But, while they ran to alert the neighbors, of that fake “Shabbat-manna”, birds swooped down and ate it. Therefore, the emphasis on “didn’t find”, to let us know that those who wanted to disrupt Shabbat could at most, disrupt Shabbat for themselves but not for all. It has also become a custom among some (and of course, some criticize it-) to share some chamin (tchulent) with the birds on this Shabbat, also known as Shabbat Shira (the Shabbat of Song because of Moses’ Song at the Sea). The Talmud points to the close proximity between going out to collect manna on Shabbat and the immediate war with Amalek. Amalek stands for doubt (because of the identical gimatria, numerical value of the words safek – doubt and amalek), for mixed priorities. Bear with me for a moment of kabbala as we bring in the Afikei Yehuda who reminds us that everything in the world is made of matter and form. For example, a wooden table is made of wood (matter), shaped like a table (form). Had it been glass or metal; had it been a chair or house, it would have been something else. It takes both – matter and form. Likewise, our week is made of matter and form. The week days (yemei chol) are the matter; Shabbat is the form. Without Shabbat the whole week has no meaning. Us stopping on Shabbat not because we’re stuck somewhere or asleep or have nothing better to do, but because it is Shabbat and we set aside anywhere from a moment at candle lighting to the traditional 25 hours, means our whole week is now elevated. And with that – Shabbat Shalom. This entry was posted in סיפורים קצרים, פרשת השבוע לחילוני האדוק and tagged beshalach, bread, chamin, Heschel, kabala, manna, shabbat, shabbat shira, Torah, Torah portion. Bookmark the permalink.